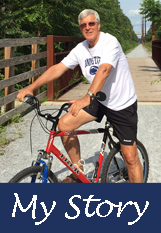 I have been a resident of Providence Township since 1980, when the Enola Low Grade Trail was an active rail line. Since our property abuts the Enola Low Grade, we had a front-row seat to watch and hear the active rail line become silent, abandoned, and eventually overgrown. Thanks to the support and enthusiasm of a small group of Providence Township citizens, the Enola Low Grade has become an active and vibrant rail-trail, now home to hundreds of biking and hiking enthusiasts of all ages. When trains stopped running and the tracks were removed I rode my mountain bike on the railroad bed, but it was extremely rough and not at all enjoyable. I always hoped the day would come when the Enola Low Grade would be transformed into a finished rail-trail that would provide enjoyable recreational use for many people. Then in June 2010, Providence Township initiated a parks and recreation committee. A group of energetic and enthusiastic people gathered at the first meeting and I was happy to join this group of dedicated enthusiasts. Our main goal was to develop and promote an easily accessible trail with a smooth surface that would accommodate walkers, hikers, bikers, and runners. Over the past seven years I have remained an active member. The committee, in collaboration with the township, has accomplished so much. Currently our township has one of the most developed and improved trails in southern Lancaster County. As we spend time on the trail, we see people of all ages, from young families pushing strollers to older people walking for cardiac rehab. Parents bring their children to pick berries along the way and runners, walkers, and bikers all greet each other with a wave and a smile. Winter is a quieter time on the trail but hardy outdoor enthusiasts are frequently seen walking with or without snowshoes, and some support cross-country skis. We have met many people outside of Providence Township who come to use the trail because of its accessibility and smooth surface. The trail has numerous trailheads that have been developed over the years to improve access and parking. Due to the increased popularity, it’s not unusual to see full parking lots on summer and fall weekends. The trail offers myriad attractions. It cuts through woodland and open farmland, beautiful scenery to enjoy in all seasons. We are very common to see wildlife while on the trail. It is common to see white-tailed deer, wild turkey, and an occasional bald eagle flying overhead. The most recent addition to the trail is the 14 benches donated by citizens and installed by the Township for people to rest and enjoy the beauty of the trail. Public support has grown and requests for project ideas have been solicited by prospective Eagle Scouts who tell us how much the trail has meant to them in their childhood. In closing, I’d like to say how much I have enjoyed working with this group of citizens dedicated to promoting safe recreation for people of all ages. This project that started seven years ago is obviously sustainable and supportive of our natural resources. I am proud to be part of the Parks and Recreation Committee and appreciative of the support we have received from Providence Township. The conversion of an abandoned trail to the active recreational venue it is today is evidence of the huge difference a few people can make. These trail improvements have been a great asset and provide safe recreational opportunities for present and future generations.